NEST 2019 is the entrance exam for admission to institutes established by the Department of Atomic Energy including the National Institute of Science Education and Research (NISER), Department of Atomic Energy Centre for Excellence in Basic Science (UM-DAE CEBS), University of Mumbai. 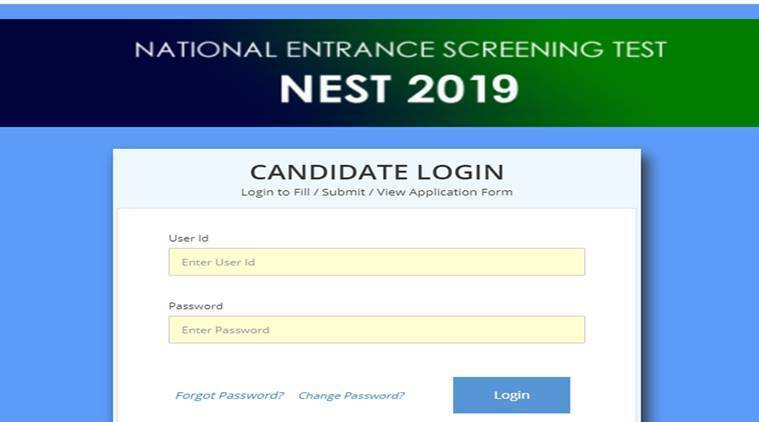 NEST 2019: The application process for the National Entrance Screening Test (NEST) 2019 has begun. NEST 2019 is the entrance exam for admission to institutes established by the Department of Atomic Energy including the National Institute of Science Education and Research (NISER), Department of Atomic Energy Centre for Excellence in Basic Science (UM-DAE CEBS), University of Mumbai. Interested candidates can apply at the official website — nestexam.in. The last date to apply is March 11, 2019 (midnight). The exam for the same will be held on June 1, 2019 (Saturday). It will be conducted in two sessions. The morning session will begin at 9 am and the afternoon session starts at 2:30 om. The exam is for 3 hours 30 minutes. Education: Candidates who have cleared the class 12 exam in 2017 or 2018 can apply for the entrance exam. The minimum qualifying marks in class 12 are 60 per cent for unreserved category candidates and it is 55 per cent for reserved category. Candidates need to select their exam centres as well. NEST 2019 will be conducted in 91 cities across India.